When does a new technology “arrive”? Invention, patent, faulty prototype, working prototype, commercialization, launch, niche market, mass market? If the Patent office registers a patent, it recognizes the “inventive kernel” of a new technology. This is a key step for the inventor of any new product or process and offers a 20 year protection from patent infringement. When a new technology reaches the consumer it has “arrived”. The issue then becomes lifespan i.e. when will it be replaced? Over 2017, electric vehicles (EV) arrived. EV has thrown down the gauntlet to the petrol/ internal combustion engine first invented by Karl Benz in 1879. EV still comes at a premium. Two cars in the same class, the Renault Zoe (EV) retails at £20,420 (€22,000) against the Renault Clio, (petrol) at £12,445 (€14,000). A key factor over 2018-2020 will be the narrowing of price differentials. That will happen and when it does EV will get to critical mass. But in 2017 that process started, electric vehicles (EV) are becoming more competitively priced with improving supporting infrastructure. It is a credible, green (zero CO emissions) and ethical alternative. German electric vehicle (EV) demand is taking off. As the home of the EU’s most proficient auto industry, what happens in Germany is a good pointer to the rest of the EU and globally. Volkswagen aims to make 3m EV’s by 2025, it has outlined plans for a €20bn investment in zero-emission vehicles by 2030. 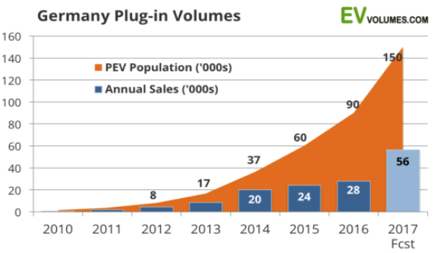 The reality is sales of EV plug ins have moved from linear demand growth to log scale – when the growth gradient goes from 15° to 70°. In summer 2017 an “AA” survey of 16,508 UK drivers 5% of respondents aged 18-24 said they already owned an EV compared to 4% aged 25-34 and just 1% over 55. EV is a “Millennial” product exposed to high spending, asset lite young people. 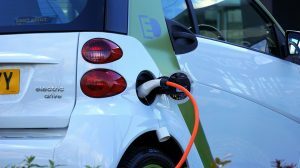 EV has significant implications for sustainable electric battery technology, for EV manufacturing processes and equipment and for the supporting infrastructure to service an EV vehicle. It has major implications for petrol/ crude oil based industries and oil/ oil services dependent countries. Both the UK and France have said that by 2040 new cars can no longer be petrol or diesel reliant. By some estimates by 2050 half of the cars on the road globally will be either battery powered or hybrid cars. 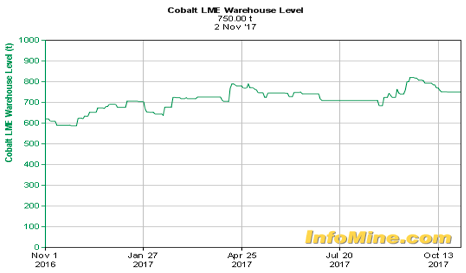 Cobalt, the raw material for EV has been experiencing buoyant demand in 2017, with London Metal Exchange inventory stockpiling in evidence. 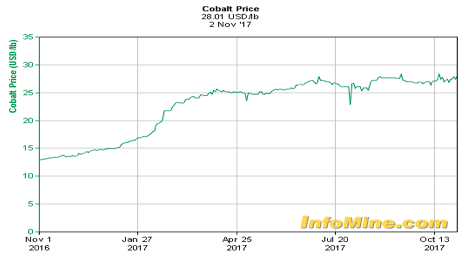 The cobalt price, now above $61,000 per MT (metric ton) has moved up from $24,000/ MT in July 2016. Cobalt is a tight market with new mine production likely to take time to catch up. But the widespread consumer uses for cobalt, in EV, mobile phone lithium batteries self-driving technologies will boost metal demand. Total cobalt demand is expected to rise to 120k MT by 2020 up 30% from the 93.9k MT consumption in 2016 according to Darton Commodities (2016). 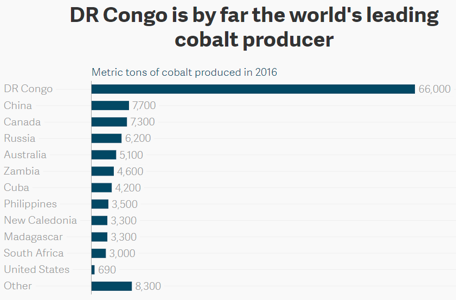 The top producer of cobalt, the Democratic Republic of Congo is a notoriously difficult place to invest with a major issue being the security of property interests. A further ethical dilemma is the widespread use of child labour (40k children work in DRC mines and supply chains). But the world needs DRC’s cobalt for the next decade. On EV infrastructure much remains to be done. Recently Transport for London announced a £4.5m budget for street charging in Greater London. This is a small commitment but it is a start! EV infrastructure will be a late starter, and key will be sufficient charging points for high density city areas, without garage access. Albemarle Corp is a USA based lithium business with three major divisions; i) Lithium and Advanced Materials (Q2 2017 sales $246m +54%) ii) Bromine specialities (Q2 sales $205m -1%) and iii) Refining solutions (Q2 sales $184m +3%). Founded in 1887, Albemarle is active in over 100 countries with a 35% global market share in lithium supply. Lithium-ion batteries (LIB) have high energy density, and low discharge rates allowing power to be both efficiently stored and delivered. The proliferation of lithium-ion into new consumer electronic devices has started to push up demand for the underlying commodities. Albemarle has focused on expanding in the lithium area almost exclusively. Albemarle has forecasted 2016-2021 compound annual growth in lithium batteries of 8% for consumer products; 30-35% in transportation (i.e. EV) and over 40% in grid storage (batteries for solar power/ grid uses). In order to meet forecast lithium metal growth, Albemarle has expanded production of Li2S (lithium sulphide pure grade) at its German plant, following on from a US expansion of its lithium salts (lithium carbonate and hydroxide) production capacity that started in 2012. The substantial investments in capacity leave Albemarle well placed to supply increased demand. According to the US Department of Energy, by 2020 around 20m PHEV (plug in hybrid electric vehicles) are expected to be on American roads. This represents an expected 8% penetration of the 253m vehicle US market with an average age of 11.4 years. Albemarle Corp has guided investors to expect net sales of $2.9bn-$3.05bn and adjusted EPS of between $4.20- $4.40. The board could consider disposals of its bromine business (brine / flame retardant products) which is experiencing competitive conditions. The EPS consensus for 2017 is undemanding in our view. Earnings growth is likely to accelerate over 2018-2020 as Albemarle growth becomes more a function of the growth in its lithium business. Albemarle’s recent acquisition of Jiangxi Jiangli New Materials lithium operations for $145m compliments existing plans to double production capacity in Chile and Australia. The business retains c. $1bn in cash for further investment. The board’s sees Albemarle as a consolidator and will continue with lithium acquisitions/ plant expansion. However the board has completed its $250m share buyback (2.3m shares acquired) so could renew its buyback authority and undertake a further programme of similar size. Johnson Matthey is a global leader in the manufacturing of i) ECT (Emission control technologies) typically catalytic converters, ii) process technologies in chemicals and oil refining, iii) platinum metal products (platinum and palladium), bio-renewable technologies and iv) active pharmaceutical ingredients. Johnson Matthey Battery Systems is a leading independent provider of battery design, development and supplies for demanding automotive applications in high performance hybrid cars, and PHEVs (plug-in hybrid electric vehicles) batteries for e-bikes, power tools and mobile technologies. At a Capital Markets Day on 21st September 2017, the board said it has developed a market leading product to address power, range and cost issues in EV. This product will draw on Johnson Matthey’s expertise in chemicals, and refined metals. Johnson Matthey will target a £200m investment from mid- 2018 to manufacture up to 10k MT p.a from 2021-2022. The commercialization of this high energy cathode material has secured six customers for testing and validation. The board claimed that demand for cathode materials will reach between US$15bn-$100bn by 2025 which will require between 500k-3.3m MT of capacity against 150k production today. Johnson Matthey thinks the cathode materials market will be worth over $30bn p.a. when EV penetration hits 10% of new vehicle sales. It expects penetration of 6% by 2025. However if EV penetration reaches 30% then the cathode market would be worth nearly $100bn. JMAT consensus estimates remain conservative in our view, with revenue growth forecasts for FY18 similar to previous years. The board is committed to a 20% return on invested capital (ROIC) about 2% above current levels. Progress on this point will be important for shareholder returns. Clean Air tech (c. 60% of sales) is likely to be impacted by the collapse in diesel car prices (linked to the VW “dieselgate” scandal). JMAT is the top supplier of diesel products. JMAT needs to show market share gains to counter loss of volume demand. Active pharma ingredients are impacted from delays in the launch of generic drugs in the key US market. 2018 should see steadier generic launches positively impacting ingredient demand. Recent delays in the launch of generic drugs is likely to impact demand for JMAT’ s active pharmaceutical ingredients. If you are interested in buying any of the above shares or you would like to look at other companies that we believe will benefit from the emerging electric vehicle industry then please leave your details here and a member of the team will contact you shortly.